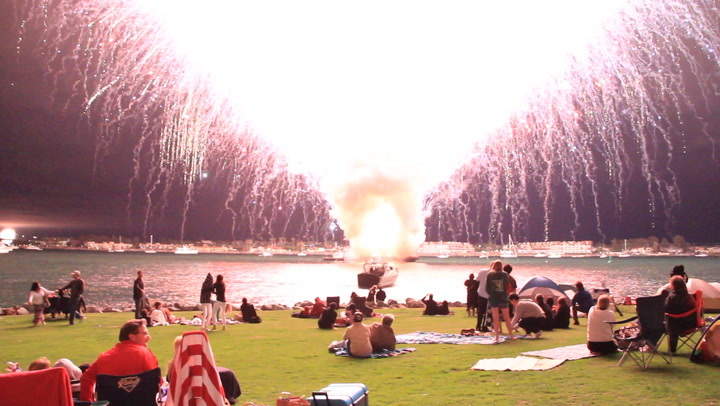 Every Fourth of July, half a million people trek out to San Diego’s parks and beaches to watch the Big Bay Boom, one of the West’s biggest fireworks displays. But in 2012, the show became an international punchline when a glitch caused 18 minutes of pyro to go off in a blinding, deafening 30 seconds. It would become one of the loudest, most epic fails in Internet history, tweeted and viewed around the world. And for Thrillist’s America Week, we wanted to get the definitive blow-by-blow account of what happened. H.P. “Sandy” Purdon, sponsor/producer, San Diego Big Bay Boom: I founded the event in 2001. When I looked out over the bay and saw what a natural amphitheater it was, I wondered why you never had any July Fourth fireworks shows. I started off with two barges and went to three and now we’re at four. There’s about 500,000 people who attend. We’ve probably raised $700,000 for the charity [the Armed Services YMCA]. Sam Bruggema, producer, Pyro Spectaculars: We did the first nine years until they brought in an out-of-town company [Jersey-based Garden State Fireworks]. 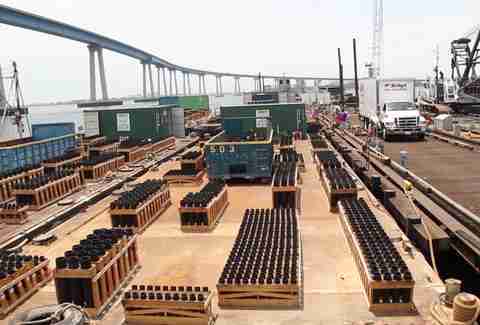 August Santore, Jr., head operator, Garden State Fireworks: It was our third time in San Diego at that point. We’ve been doing this a long time. My great-grandfather started the company in 1890 in Italy. He started apprenticing for a fireworks company as a 10-year-old boy. Now the business is into its fifth generation. By the time I was 12, 14 years old, I was already running operations here. Purdon: They did a great job the year before. Santore: I had worked already nine months on it at that point, probably thousands of man-hours. It was a 17.5-minute fireworks show that had every effect -- from a pulsing strobe, disco-type thing to hearts to stars to rings to cubes, to smiley faces to giant weeping willows to red, white, and blue, to a variety of noises and thunders, flying fish, screaming whistles, everything you can imagine. Every last little thing you put into it is designed for perfection. Steve Frailey, co-owner, Pacific Tugboat Service: It takes days to set up, first lining up the canons, then testing. The cannons are made of PVC pipe of different diameters stacked together in rows and rows with walkways between ‘em, like short corn stalks. The fireworks themselves look like a coconut with a little wick coming out of it. Then they run wires to a computer station at one end of the barge where all the controls are. Santore: I’m on the roof of the Hilton controlling all the events. I’m orchestrating things with the radio station, TV, Coast Guard, and sponsors. Everything has to come through me. Purdon: I do a party to thank all the sponsors at my house, which overlooks the bay. In my office I have a control center, with radios to the Coast Guard and Harbor Police, to the fireworks people and the tugboats with the barges. About half-hour before the show, I’m checking things out with my binoculars to make sure those things are happening at the right time. Captain Mike Crouch, Pacific Tugboat: When you've got about three minutes before the shoot, you’re in position, holding the barge in place. Everybody is where they’re supposed to be, life jackets, hard hats. The pyrotechs, they’re in full fire suits behind their blast shield. Everybody’s got earplugs in, earmuffs on. All the barges [are supposed to] go off coordinated and they’re all synchronized to music. 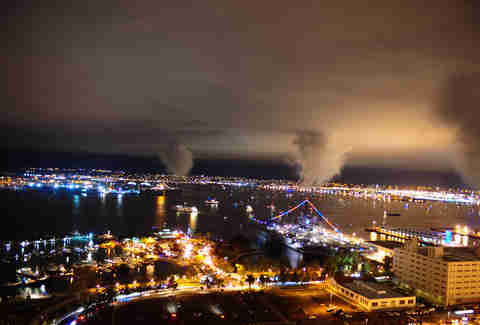 Dan Roy, attendee: It was my first time seeing the fireworks in San Diego. Traffic was really backed up downtown. There were a couple hundred people on the grass with blankets and coolers, kind of tailgating it. I decided at the last minute to run down to my car and grab my camera. Santore: I sent a signal and the signal starts the code and the code starts the computers and the computers start the file. Roy: We could see the barge right close to where we were. There was no countdown. I had my back turned to make sure the lighting settings were right on the camera, and that’s when I heard the explosion. Frailey: Suddenly everything was lit up on all four barges in a way that none of us had ever seen before. I watched it for a few minutes and thought, “This is the strangest pre-show I’ve ever seen.” None of this was discussed at any of the meetings. Crouch: When that thing went off like that, it scared the crap out of me. You have to imagine this barge: 135 feet long, 45 feet wide. It’s heavy. The barge probably jumped a good six inches. The tug jumped. I ducked. Everything shook. Frailey: This was like every grand finale you’ve ever heard, in the room with you. Absolute cacophony. Crouch: It reminded me of Vietnam. It was a lot of gun powder and sulfur. Roy: Somehow people were not running away. People were cheering really loudly at the end. They were looking at each other like, That was amazing! I can’t even imagine what’s happening next. Roy: Everybody was in shock and waiting for something else. All this debris started raining down on our heads; it looked like burned-up toilet paper rolls. It was gross and weird. That was one confirmation that something was wrong. The other confirmation was that the barges just slunk away without a word. Purdon: There’s about 130 people in my house: sponsors, people from the Armed Services YMCA. The guests were all looking at me, and I was trying to figure out what crack in the deck can I hide under. I called Augie Santore on his cell phone and he says, “We’re trying to figure out what’s going on,” so we just kinda waited. Santore: The most important thing I had to do was to make sure all my guys are OK. There are real people out there that are taking a lot of risks in this industry. Our concern is about them. I was very glad to know that they followed their instructions and they were perfectly fine. Then I went to run some diagnostics. It was a computer error. A set of instructions that were given that we didn’t necessarily create, that was created by the system. Bruggema: My phone blew up. Everybody thought it was me. I still haven’t lived it down and I’m not even the company that did it. It was nonstop for the next two and a half hours. My phone never stopped ringing and my battery went dead. When I plugged it in again, I had like 97 messages. Purdon: Once we knew that nobody was hurt and that it was a glitch in the computer system, we issued an apology to the public via the radio and TV and then moved on to the rest of the night, trying to make sure there was no debris in the bay and we were cleaning up properly. Santore: I’m not a person who dodges anything ever. I eventually went to bed at 2 or 3 in the morning. The next morning I had to leave to go do a big event on the East Coast. I woke up at 6 o’clock, got my stuff together, spoke with 40 or 50 members of the press, got on a plane, and flew back East. I told Sandy if he wanted to have us back that we would do the show for nothing. Roy: I knew I had a good video but I didn’t think I was the only person who had a nice DSLR camera. I posted it on the San Diego subreddit and then someone reposted it to videos and it went to No. 1. That’s when it really hit. Roy: I got a phone call from a TV station in Japan that wanted to show it. I got an email from Rock Center with Brian Williams. And somebody from CNN called. I made $3,000 for just pointing a camera in the right direction at the right time, which was nice considering it was totally an accident. Frailey: It got a lot of attention for San Diego around the world. Sales of fireworks went up after that. Frailey: A couple years later we had a customer who wanted to do a fireworks show where it was 20 minutes of fireworks squeezed into less than three minutes because they wanted to recreate it. Crouch: [In 2013] there was tension in the air. I think everybody was wondering, “What’s going to take place this time?” The pyrotechs and the fire marshal, they were going over these barges with fine-toothed combs. Roy: Sandy Purdon found out who I was and invited me to come film the fireworks at his place the next year. The party was packed. He was definitely nervous. Purdon: Garden State came back and provided us with a free event in 2013. They did a great job. They lost the bid in 2014 and ’15, but they’re certainly welcome to bid every year. They’re a good company. Bruggema: It’s a drag that it happened to them. But I’m happy to say that I got the show back. This year there’s gonna be fireworks in the show that have never been seen in San Diego. Purdon: We’ve increased the budget. I’m told they’ve obtained some interesting pyrotechnics from around the world, Italy to Portugal to China, South Korea. Santore: [We] have competitors trying to drum this down people’s throats. Sure, it didn’t help us. Like anything in life, things happen. You can be the best race car driver in the world and slam into the wall on the third turn because all of a sudden a tire blows out. Nobody ever wants to talk about the 6,000 great things that you did, only the one bad one. Give me the worst event of your life and let’s spend an hour on it. Let’s talk about your high school prom. Maya Kroth has interviewed a range of noteworthy characters, including an eccentric Tijuana architect, the leader of the Honduran congress, a Spanish sword-maker, and a team of hipster puppeteers. Her work has appeared in Foreign Policy, The Washington Post, The Christian Science Monitor, and TheAtlantic.com. She is currently writing a book about naps.